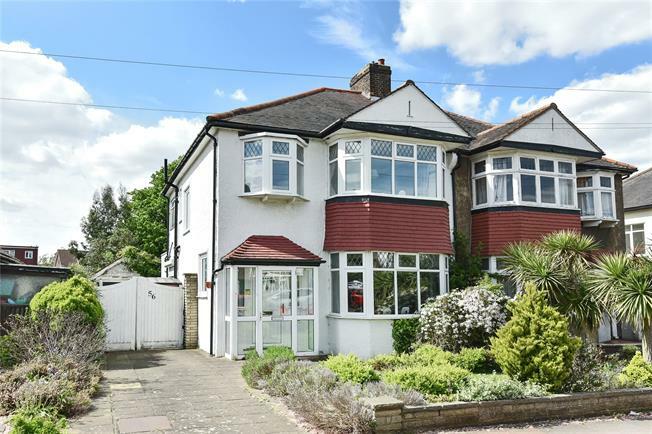 3 Bedroom Semi Detached House For Sale in West Wickham for Asking Price £650,000. Langley catchment. Three bedroom semi-detached family home set on a sought after road just off West Wickham High Street. This property is light and airy offers spacious accommodation and briefly comprises; porch, entrance hall, 17'7 front reception room with fireplace, cloakroom and a fitted kitchen with an archway to an extended reception room measuring 23'11 x 11'6 with doors out to garden. Upstairs there is a family bathroom, separate WC and three bedrooms, two with fitted wardrobes and one with a basin. Externally the secluded rear garden is landscaped with an array of mature trees and shrubs, a pond, patio, a further decked seating area and a detached garage. To the front there is a lawn, off-street parking and a driveway with electric gates leading to the garage. Ravenswood Avenue is close by the high street, West Wickham Station, leisure centre and schools of good repute including Langley Boys and Langley Girls Secondary Schools and Oak Lodge Primary. Viewing recommended.